How about a year-round tax holiday? When it comes to tax relief, I am a committed Friedmanite: I embrace the teaching of the late great Milton Friedman, a Nobel laureate in economics, who often declared that he was "in favor of any tax cut, under any circumstances, in any way, in any form whatsoever." Friedman's premise was that the best way to curb raging government spending was to curb the government's income, and that the best way to do that was to reduce taxes. So I suppose I should be glad that the Massachusetts Legislature has designated next Saturday and Sunday as the Commonwealth's annual sales-tax holiday. Two days of tax-free shopping, a chance to buy that new freezer or computer or necklace - or simply to stock up on school supplies, toiletries, and batteries - without having to pay the state's usual 6.25 percent levy on purchases: What's not to like? If experience is any guide, stores and malls will be thronged with shoppers, and $25 million that would otherwise have enriched the state Treasury will remain in the pockets of private citizens. It's all good, right? Tax-free weekends are little more than a stunt, a dose of fiscal snake oil that cures no ills, but merely provides momentary relief from the pains of overtaxation. The yearly respites from sales taxes are popular, and politicians are happy to flaunt them as evidence of their taxpayer-friendly bona fides. "This is an economic win-win for families, businesses, and the Commonwealth alike," state Senator Michael Moore exulted after last year's tax holiday was enacted. In five states - including New Hampshire, just over the Massachusetts border - sales-tax "holidays" last not two days, but all year. That's one difference between a gimmick and a policy. It would be pretty to think so. But there is prodigious evidence that sales tax holidays, which are scheduled this year in 16 states besides Massachusetts, don't increase overall sales and don't boost economic growth. Sure, retailers will see a lot of traffic next weekend - but it will largely come at the expense of sales they would have rung up earlier or later in the season if customers hadn't adjusted the timing of their purchase to take advantage of the tax break. When New York analyzed the results of suspending its sales tax on clothing for seven days in January 1997, it found that sales during the no-tax week were 73 percent higher than was typical for a week in January. Yet clothing sales for the full quarter were virtually unchanged from the year before. On the whole, sales tax holidays don't stimulate new sales; they only shift the timing of anticipated sales. "For retailers, this week has been the lull before what they expect will be a storm of customers tomorrow and Sunday," began a story in the Boston Globe on the eve of the Bay State's no-tax weekend in 2010. "Consumers have been sizing up what they want, but holding off on making major purchases so they can reap savings this weekend." As economists know, that's what you can expect when the government tries to tell people when to shop. This isn't to say that big retailers don't lobby for these tax-free weekends, sometimes mangling reality in the process. Jon Hurst, the president of the Retailers Association of Massachusetts, describes the commonwealth's two-day tax holiday as its "most important economic incentive" since it is targeted to ordinary consumers. He disputes the Revenue Department's estimate that $25 million will be forgone in state tax collections. Because many stores schedule sales in the week leading up to the tax holiday, Hurst says, "the consumer is gaining a great deal and the state is getting all their sales tax." The retailers association has even argued that, thanks to the tax-free weekend, the state reaps significant tax gains. Well, as Milton Friedman might say, if a tax cut increases government revenues, then taxes haven't been cut enough. Actually, some retailers use the customer rush triggered by a legislated tax holiday to increase prices. The greatest savings are often to be found before the tax-free weekend begins, with markdowns disappearing once the state's heavily-promoted tax break kicks in. Just because retailers may support a sales-tax holiday, the nonpartisan Tax Foundation remarks dryly, is no reason to assume it's a good idea. What would be a good idea is to cut sales taxes year-round. 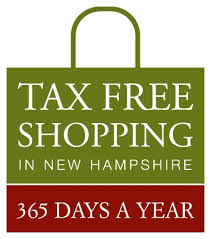 In New Hampshire (and four other states), every day is a tax-free shopping day. In 31 other states, sales-tax rates are lower than the 6.25 percent charged in Massachusetts. The difference between a two-day tax break and a permanent tax cut is the difference between a trivial gimmick and a rational policy. If we had the latter, we wouldn't crave the former.